Cafe Bustelo — mary g.
Cafe Bustelo is a bold and energetic coffee brand looking to stand out from the clutter in the retail environment. With expanded distribution for two of their products, Instant Coffee Sticks and Bustelo Cools, it was important to design in-store displays that provided product education while also portraying the energy and vibrance of the brand. The concept for this design came from the product packaging, which features a pattern reminiscent of traditional Mexican Talavera tiles. On the side panels the pattern is knocked out in the brand's blue, and the icons that make up the pattern were brought front-and-center on the header, to convey that each Instant Stick contains coffee, sweetener and flavor. 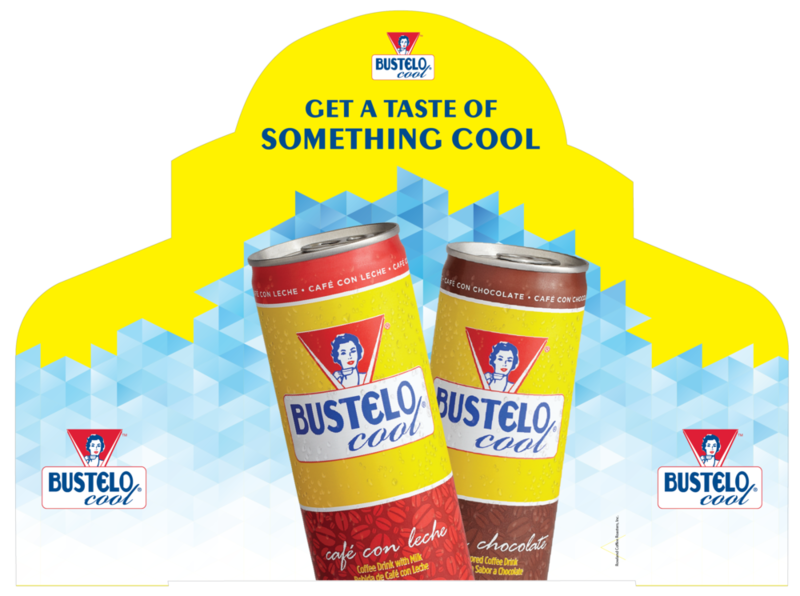 To showcase the frosty nature of Bustelo Cools, an abstract geometric ice emanates from the cans, contrasting with the sunny yellow background.